A painting on display at Johnstons Apts in Crown Point by artist and teacher Gail Pantin. Artist and teacher Gail Pantin is working on an ambition series of paintings - 100 portraits of persons born in both Trinidad and Tobago - currently focussing on pannists, capturing their style and mood. Pantin, best known for her panoramic landscapes and portraits, is also well known for her depictions of the life and culture of people, places, and communities. 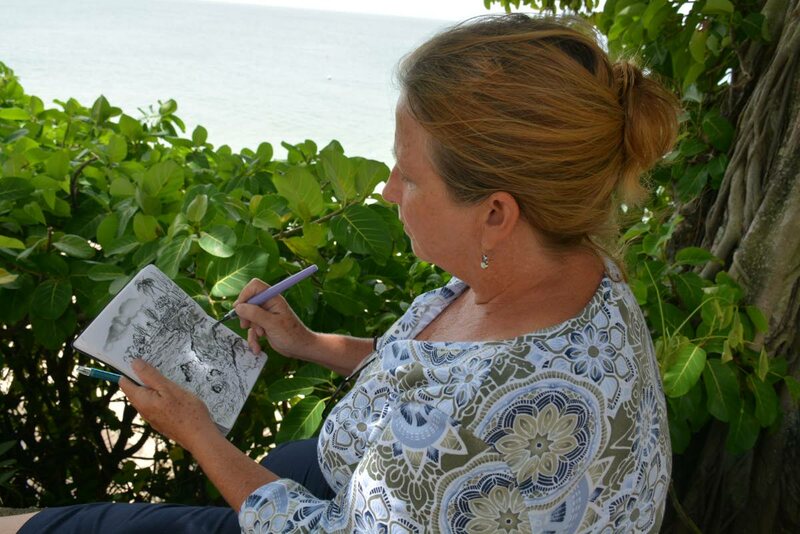 In a recent interview in Tobago, where she was engaged in sketching Tobagonians and the island’s beaches, she said different people will see her work differently and arrive at their own interpretations. “Art speaks on my behalf and explains things I don’t want to discuss verbally. I have seen the effect art has on me and its impact on others. I feel the world is a better place for all of us when we participate, use and experience art,” she said. As for her style, and subjects, Pantin works with pencil, watercolour, acrylic, pen and ink and Japanese brush pen and her art reflects much of her 20-year-experience in Southeast Asia. “My style goes from realistic to abstract, my subjects vary from portraits of people, houses, beaches and everything in-between. I can start the day with a portrait of someone, by lunchtime I can do a watercolour of a flower. By evening, I can do a long Japanese-style brush pen painting of a street,” she said. Her one constant is people, she sees art as nothing without people. “As a teacher I would often remind my students that it is all well and good that you want to do a painting, but we must always consider that our objective should also be to consider the viewer… looking at the work trying to understand the artist’s point of view,” she advised. Her interest in Asian culture developing from her days as a student at Holy Name Convent, Pantin, whose father Kevin is a Tobagonian and her mother from Manzanilla, travelled to Singapore in 1995 to a teaching job. While there, she travelled and painted, and was very involved in various artistic projects. Through art, she highlighted Singapore’s growth and change over the 1998-2015 period, including the construction of the Singapore Waterfront. In 2008, she was commissioned by the then President of Singapore, Sellapan Ramanathan, to create a series of panoramic sketches of the 1898 Neo-Palladian Istana, the official residence of the President and Prime Minister of Singapore. Her sketches were published in a book entitled, A Day at the Istana. Singapore, Bangkok, and in TT, showing over the last three years, Pan Rhythms & People I- Exhibited (2015), Pan Rhythms & People II - All new works (2016), Pan Rhythms & People III-All new works, The Art Society of T&T (2017). In Tobago, artl overs can see Pantin’s work at Johnsons apartments, Store Bay, and at the Bambu Gift shop on Milford Road. Reply to "Gail Pantin: Art speaks on my behalf"